iStick 50W is a super upgraded version based on iStick series batteries. Powerful vapor can be generated due to the expanded range of output voltage (2V-10V)/ wattage (5W-50W) with 4400 mAh battery capacity. It retains strong spring connector and wear-resistant stainless steel thread. Moreover, the additional temperature alarm function makes it high-safety even in strong vaping. Great feeling when you hold it because of its size and the rounded edges, while side charging port is also a plus. Press the rectangle button for five times to turn on the battery, and then long press it to get a puff. Loosen the button to stop puff. Press the rectangle button for three times to switch the VV/VW mode when the battery is on. 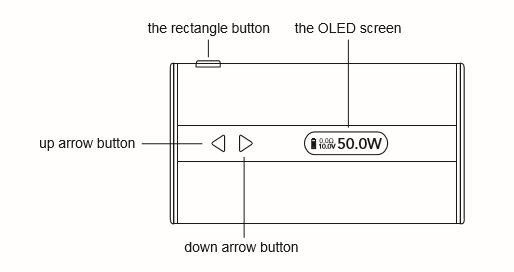 In VV mode, you can adjust output voltage between 2.0V-10.0V. In VW mode, you can adjust output wattage between 5W-50W. Press the up-and-down arrow buttons to increase or decrease the voltage/wattage. Keep pressing the up/down arrow button, voltage/wattage will increase or decrease slowly at first, then they will increase/decrease at a constantly high speed. The number will stop increasing/decreasing when you loosen the up/down arrow button. Temperature Alarm: If the temperature of device is over 70℃, the output will shut off automatically and the screen will reflect "Temp Protection" for 5 seconds. After that, the screen will back to normal and then you can continue vaping. Keep pressing up-arrow button and down-arrow button simultaneously for 2 seconds when the battery is on, then they will be locked and the screen will reflect "Lock". Still keep pressing simultaneously for 2 seconds to unlock them and the screen will reflect "Unlock". Through these operations, you can protect the buttons from unintentional presses and prolong their service life. Powered by Well-known Electronic Cigarette brand Eleaf.